Spinning in the ‘rock room’ today is the perfect album for the stunning decay of an early Fall day. New Orleans native Bobby Charles, long a proponent and disseminator of a genre of music lovingly referred to as swamp pop, recorded his debut solo LP, not in the Bayou State wetlands but at Bearsville studios in Woodstock, N.Y. Rick Danko and John Simon, famous for their entrenchment in the Band, co-produced the album with Charles. Charles had actually moved to Woodstock in the early 1970s, long after his song ‘See You Later Alligator’ was a 1956 hit for Bill Haley and the Comets. He set up shop at Bearsville with the help of famed manager Albert Grossman. The result of this musical Louisiana boy woodshedding up north resulted in a collection of funky country grooves, muddy rutted melodies and rustic songwriting. Sometimes referred to as the lost Band album because of their relationship with the record, this obscure 1972 classic is brimming with guest stars; local and from out of town, names big and small who contribute to produce unpretentious roots, rock and soul music. A glance at the laundry list of supporting musicians illustrates the wealth of musical power represented on the record. Four out of the five members of the Band are credited on Bobby Charles, and I am of the opinion that there are some moments where the guitar work sounds suspiciously like the apparently missing Robbie Robertson. (He was, after all, pictured at the sessions.) Also included are Amos Garrett, Ben Keith, Bobby Neuwirth, Dr. John, David Sanborn, Geoff Muldaur, Ben Keith and John Till among others. The home-cooked and intimate production values offered up from Danko and Simon then serve to stir the jambalaya pot. The only unfortunate factor remains a lack of definitive song credits for who played on what tracks, even all these years later. The credit note in the album reads: “All Musical Arrangements Homemade,” which is fitting due to the records collaborative and rustic elements. Bobby Charles begins with the sideways strut of “Street People,” a slippery analysis of the separation between the people of economy and proponents of the road. A bopping country bump pushes the groove, underlined with shimmery back-porch slide guitars. The second track, ‘Long Face,’ sounds as if it fell off of the second side of a Band record. 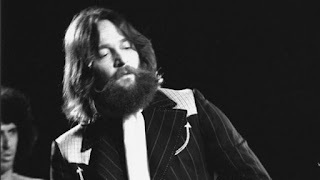 What is unmistakably Levon Helm’s woody thump on drums, Garth Hudson’s swirling fingers on organ and Rick Danko moving air on bass equates to a track that sounds as rich and practiced as its supporting instrumentalists. Rumor is that Dr. John helps out on guitar and that John Simon tinkles on piano respectively, though it could be Richard Manuel on keys, as well. The auditory elements of the track remind me of the time when the key production values in a studio were patience and warmth. The groove of the song is addictive, and its saloon sensibilities illicit a local flavor. ‘I Must Be In A Good Place Now’ continues the pastoral attitude of the record. Slow and easy, Charles’ encouraging and gentle vocals lounge on the airy instrumentation. The backing group plays as one on this fantastic track, with no single instrument discernible as they stitch themselves into a delicate, lacy supporting sound. ‘Save Me Jesus’ follows with a sweet audio verite' moment, with the listener ushered into a take in progress. The soft soulful swing reeks of the moist moss and hearty dark earth of Louisiana. The instrumental backing sounds like the core studio group of Amos Garrett on guitar, Jim Colegrove on bass and N.D. Smart on drums, with the band acting like a lonesome country tire swing pushed by a Bearsville breeze. Lyrically, the song is a hopeful wish for help from Jesus, as Charles has finally lost all hope in humanity. His deadpan delivery is an additional highlight to this deep cut. ‘He’s Got All the Whiskey’ trickles down the rain spout, with horns and acoustic guitars patiently coalescing together under Charles wordless moans. He sets the beat with hand claps before the drums drop in and the song becomes a display of down-and-dirty gut bucket soul. A collection of horns rise from the horizon, an illuminated mist composed of Garth Hudson, David Sanborn and John Simon interweaving and winding around one another in a stunning and breathy series of blasts. Charles accompanying vocal melody verbalizes a mantra of jealous statements all sung from a comfortable easy chair. Side two begins with the Charles/Danko co-written ‘Small Town Talk,’ a track which Danko would also record on his later solo debut. This idiosyncratic song starts with a whistle and continues, supported by some spongy Dr. John keyboards and the rock solid swinging Levon Helm groove. Charles’ matter-of-fact vocals sit nicely inside the airy burlap arrangement. A gentle country lilt follows, as ‘Let Yourself Go’ is highlighted by Ben Keith’s weeping pedal steel work, absolutely breathtaking. This particular song would slot into one of that era’s Poco or Flying Burrito Brothers albums nicely. “Grow Too Old” is a big song with an immense sound and substantial step. I am going to take a chance and say that Richard Manuel plays piano, and possibly sings harmony on this song; due to the fact he would later feature it in his own solo concerts, and that it sounds quite like him at times. Regardless, the song slams around joyously on trebled guitar, rock and roll piano and hot horn playing, securing the vibe of the sessions in a perfect way. This performance is one of the finest on Bobby Charles and one of Charles greatest songs. Keeping the foot stomping going, ‘I’m That Way’ again features the multiple talents of Ben Keith, this time on a slick Dobro. 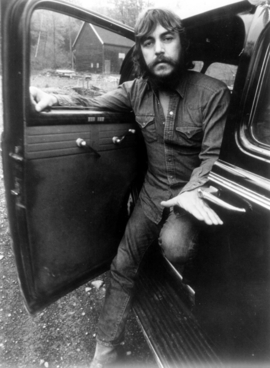 The song features a hillbilly groove and an apathetic attitude, recalling a rollicking back road run through the Catskill Mountains. 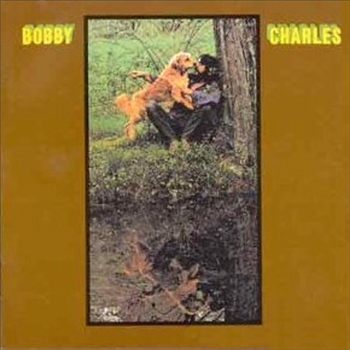 ‘Tennessee Blues’ closes the Bobby Charles album with an epic and emotive ballad that defies genre classifications. What I believe to be Amos Garrett’s delicate gold-leaf guitar, dresses the song in a geographical specific country soul. When Garth Hudson’s accordion appears during the verse, the song levitates through the trees and into the air, becoming a rare bird in flight. Charles’ floral melody line, childlike in its gentle delivery, eases through the leafy green chord changes. With the approaching instrumental segment the song turns sepia, its corners worn smooth into timelessness. 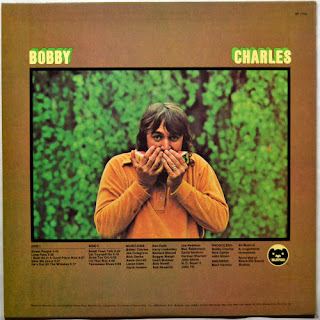 Fast forward more than four decades, and Bobby Charles’ self-titled 1972 release has gained what notoriety it has today through its association with the Band, and it’s various famous musical principals. What its legacy should be based on in addition to this fact is its timeless and beautiful songs. Already recognized for his songwriting prowess prior to this, Charles developed a period-piece gem containing music of multiple classifications built around truthful and original themes. He had no issue collecting an impressive arsenal of sympathetic musicians to express his composed ideas because of his own notoriety and earned respect with the artists themselves. Rock aficionados will appreciate the multiple representations of country rock, as well as the roots aspect of the record, all of it so beautifully brought into focus through honest musicianship and masterful songwriting.